Centurion 100, 115V - ADVANCED DENTAL PRODUCTS, INC. 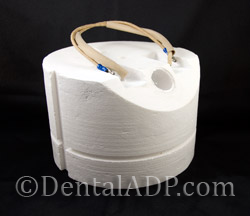 The Even-Temp™ quartz sleeve muffle is designed for the Dentsply Ceramco Centurion 100 furnace. It provides even temperature distribution, rapid cooling and long life. All Even-Temp™ muffles are warranted for one year and can be purchased at a substantial savings when compared to the OEM. Be the first to review “Centurion 100, 115V” Click here to cancel reply.